In particular, this theme soon captured the attention of some of my friends at the Instituto de Astrofísica de Canarias (IAC, Spain), as they weekly produce an amazing ~2h science communication podcast Coffee Break: Señal y Ruido (Signal to noise). I’m proud to participate in this podcast from time to time, remotely from Sydney. Coffee Break: Señal y Ruido is, at the moment, one of the most important science communication podcasts in Spanish, with tens of thousands of listeners every week, and broadcasted weekly in several radio stations in Spain and South America. 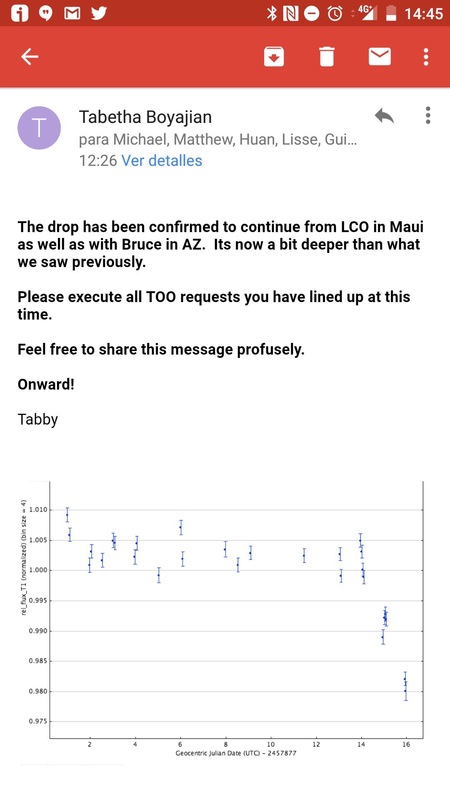 Well, as the “core” of Coffee Break: Señal y Ruido are IAC astronomers, they decided to submit an observing proposal to get time to obtain spectroscopic data of Tabby’s star using the 1.2m Mercator Telescope, located at the Roque de los Muchachos Observatory (La Palma, Canary Island, Spain). The proposal is led by Marian Martínez González, with Héctor Socas-Navarro, Andrés Asensio, Carlos Westendorp and Carlos González in the team. They got time last week, and were observing till last Wednesday night. They did a great job in social media (please follow @pcoffeebreak) under the hashtag “CB_Tabby“, explaining how observations are conducted in professional telescopes and the results they were obtaining on the fly. Plot showing the relative brightness of Tabby’s star with time, obtained by Las Cumbres Observatory Global Telescope network. The lowest point shows a 2% drop. Many media, including Sky and Telescope, New Scientist and Popular Science, have included the news in the last few hours, that is also running wild in social media. 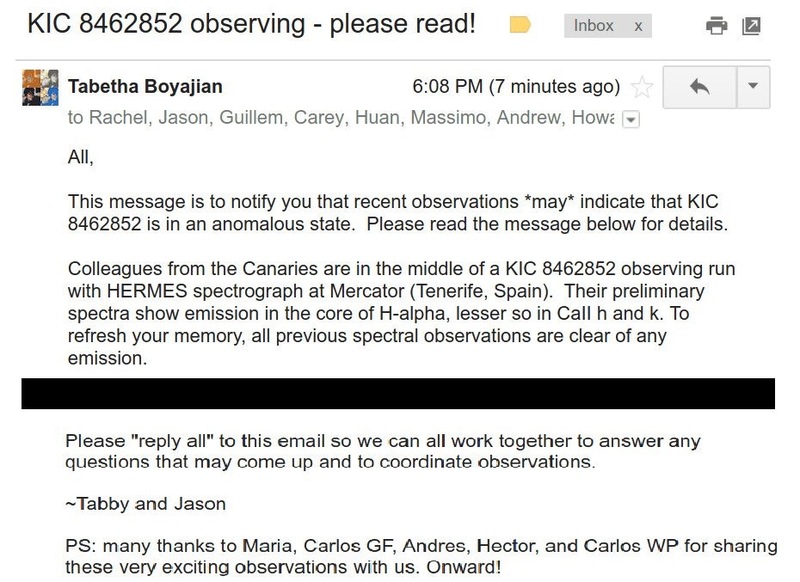 But none of these are saying that the actual alert comes from the observations lead by Marian Martínez González (IAC) and “Coffee Breakers” at the 1.2m Mercator Telescope at the beginning of the week! I really think this is not fair, and proper credit to the team that actually triggered the alert at the beginning of the week must be given. Now, professional astronomers are triggering the “targets of opportunity” to observe Tabby’s star with small and big telescopes. But amateur astronomers are also invited to contribute too! 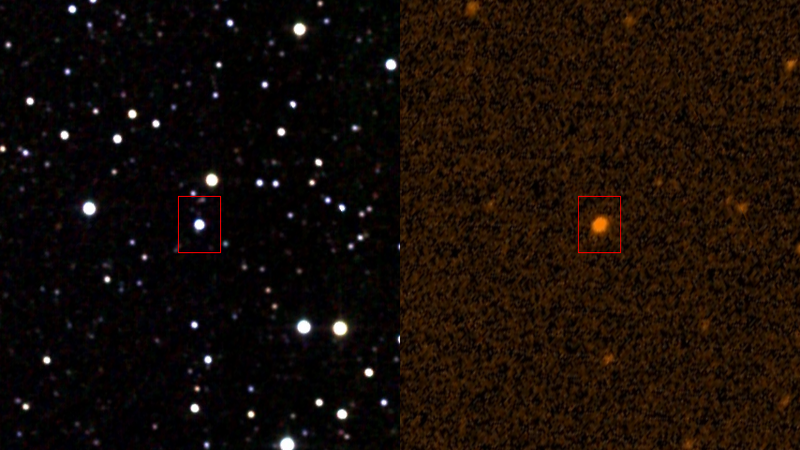 KIC 8462852 or Tabby’s Star is a 11.7 magnitude star visible with telescopes larger than 5 inches (130 mm) in a dark sky. It is located in the constellation Cygnus (hence, it is visible for all the Northern hemisphere and part of the South hemisphere, although a bit too low for latitudes below 20 degrees south). 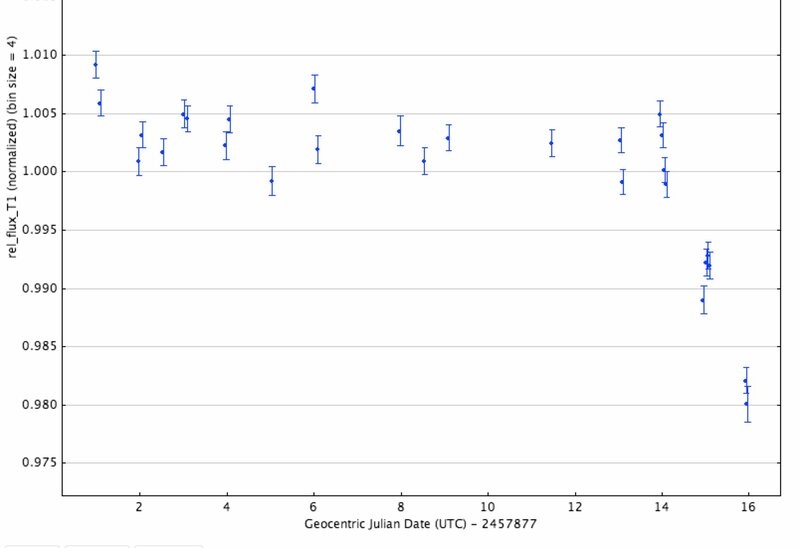 If you have an equipment that allows to get accurate photometry using several broad-band filters and are interested on contributing to real scientific observations, please don’t hesitate: try to observe KIC 8462852 these days. This entry was posted in Amateur, Astrophysics, Observation, Optical, Profesional, Stars and tagged 2017, observations, Star, Tabby. Bookmark the permalink. Is this only a visible spectrum dimming? Has anyone done a full spectrum analysis? Are there plans to do this?